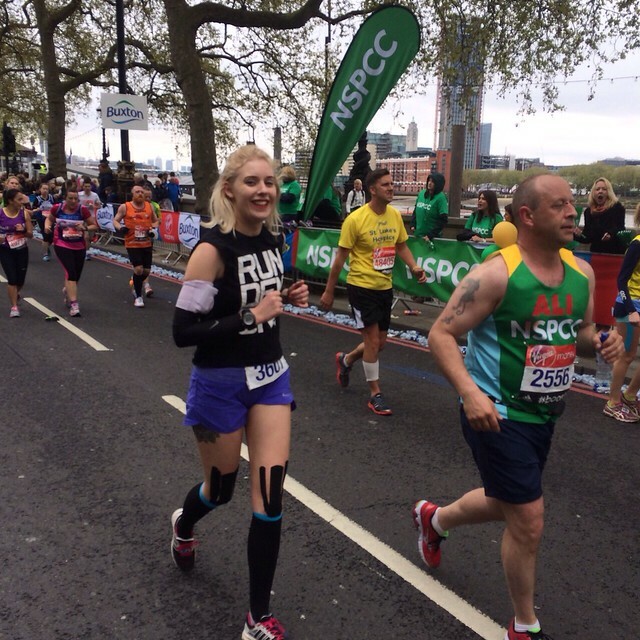 Yesterday I ran the London marathon. Despite the fact the medal is laying less than a metre from me, when I look at that sentence it still doesn’t seem real. Yesterday was an absolute slog and an absolute blur at the same time. I ran for 5 hours and 17 minutes – that is a bloody long time, but there are big stretches of the race I already don’t remember. 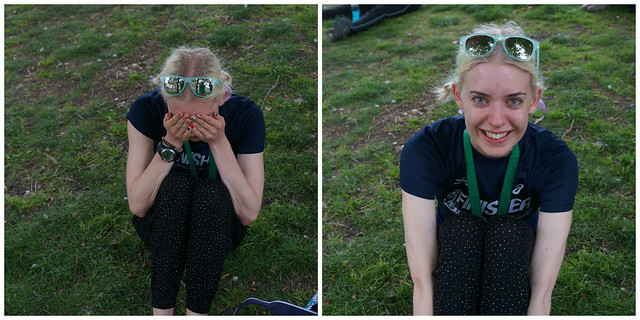 To say that I enjoyed running the London marathon would be lying. And I hate that that’s the case. I’m sorry to anyone who would’ve run it and loved every step. I hated every minute of training for this race – once I got injured and I couldn’t do many of my long runs, the whole thing just made me really stressed out. Yesterday was hard. I had been having stomach ‘issues’ in the few days leading up to the race and on the day itself they didn’t go away. I ran from 8 mile onwards with my stomach constantly cramping. From half way I had to adopt a walk/run strategy as it was so uncomfortable. Stress does funny things to your body. 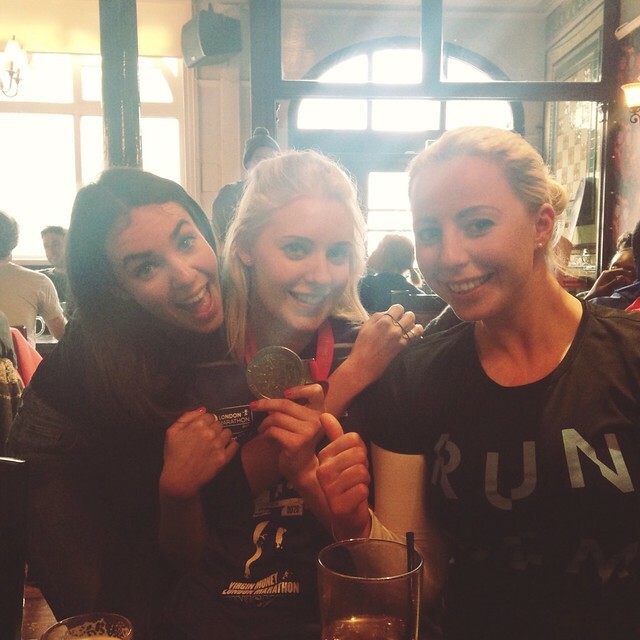 I wouldn’t have got through the race without two people – Stephanie and Michelle. Steph was with me at my house before the race, made my breakfast, taped up my knees and escorted me to the start. She was then at 14.5 miles, exactly where I needed her and got me round the bleak Isle of Dogs and Canary Wharf section and in to mile 21. 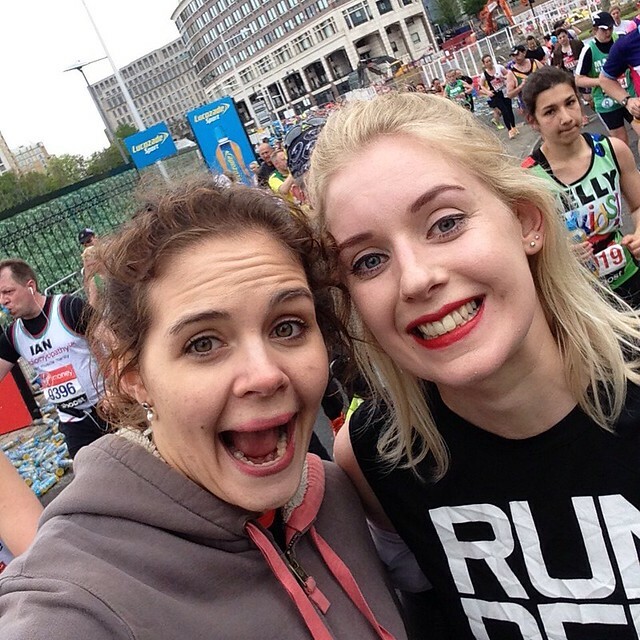 She was my marathon saviour. Michelle then took me from mile 21 to the finish, and was pulled out by a lovely and understanding marshall with 400m to go. She took me through the miles where I just wanted it to be over and reminded me to just take it all in and enjoy the moment – “smile, you are running London”. By this point, I was much happier walking, so we did. We walked a lot of the Embankment stretch and she helped me appreciate the spectacle I was a part of. For the first 8 miles, I was flying. I was tucked in a few metres behind the 4:30 pacer, I passed through 10k at 1:03 and I loved running around Greenwich and Cutty Sark. But after that, it was just tough. After a loo stop, I never really found my rhythm again. There were several moments where I did not know how I was going to make it to the finish line. But somehow I did. I’m really, really glad I’ve run the London marathon. I’m so grateful I got pulled from the ballot and I’m over the moon I got to experience my hometown run from the other side of the fence. But I’m also content knowing that marathons aren’t for me. I’ve run two and although I’m proud of myself for doing them, I have no desire to do another one anytime soon. Maybe that will change at some point in the future, but right now, no. I’m really thankful I knew I loved running before training for this race. If I had been through all the training and running the marathon in isolation, it would have put me off running for life. Running a marathon is hard. And it’s really quite far. I can’t wait to just stick to halves. Today I feel a bit dazed and a lot broken. I’m so glad it’s done. To say my training hasn’t gone to plan would be an understatement. The furthest I’ve run in the last few months is 15 miles, I’ve probably averaged less than 2 runs a week and ever since my knees started hurting in the last couple of miles of the Brighton half back in February, I’ve been confused as to how some runs can be awesome whilst others leave me crying in pain. If it wasn’t for a brilliant run at the Berlin half a fortnight ago, the likelihood is I wouldn’t even be contemplating trying to attempt a marathon on such shoddy training. But it was such a good race and I’m feeling a massive confidence boost from how strong I felt throughout. I definitely finished with more to give… how much more that could have been I have no idea. Having missed so many of my training runs, I’ve (sort of) made peace with the fact that running London isn’t going to be the speediest or most pleasurable experience. My knees will hurt, I’ll feel knackered much earlier than I would’ve liked and I may well have to call on the offers of help I’ve had from friends. I was never going to set any records, I mostly just want to keep up my New Years resolution to always run happy. I’m going to try and remember this for as much of the race as possible. I keep going back to the feeling of how lucky I am to have a ballot place in one of the world’s greatest marathons. The next two weeks are all about ensuring I am as well as I can be on race day. Being well rested might end up being my biggest asset – it sure as hell won’t be being well trained. Good food, lots of sleep, no booze and some gentle miles are in store over the next fortnight. Keeping calm in the face of growing hype all over my social media feeds will be enough of a challenge as it is. 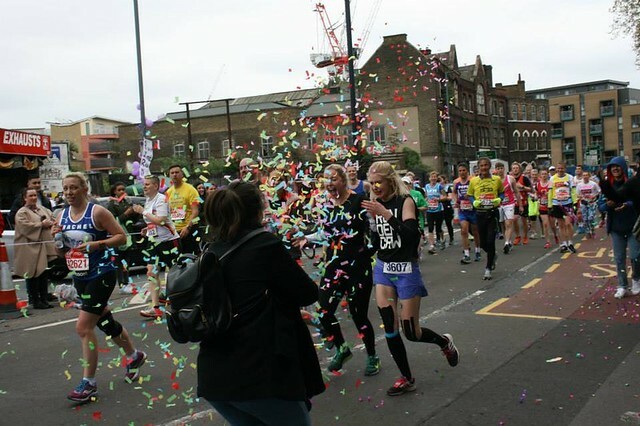 What do you do when your first attempt at a marathon was so delicious in every way that the second time around is never going to live up to the pain, the dedication, the journey and the joy? Despite a much sought after ballot place for London being in my possession, I just cannot find the passion to train for this thing in a way that’s going to mean I’ve done the best I could have done. Scared I’m on the verge of wasting a precious opportunity, I have only five weeks to try and salvage my training. A whole month of lost mileage, angry knees and sore glutes has passed and I am left with a seriously damaged belief that this is even possible. 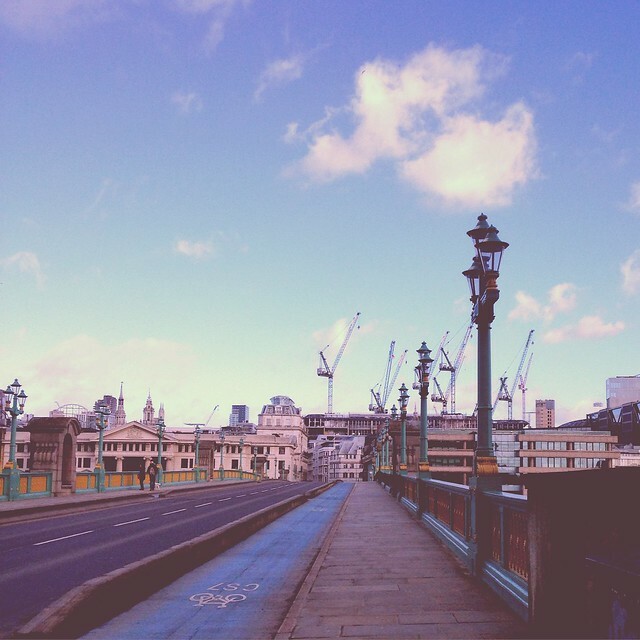 26.2 miles is a terrifyingly long distance at this point in time, but it is LONDON. There is no way that this isn’t happening. Today I’ve woken up easier and clambered out of bed quicker than I have done in weeks. It’s brilliant that even on an early Monday morning (on Mondays I start work over an hour earlier than the rest of the week) it is now pretty much light when I open my blind just after 6am. Spring definitely sprung in London this weekend, and with it brought the short shorts out for the first time in several months. After years of insisting I’m a cold weather runner, I’m beginning to think that my enjoyment of a run is in fact directly influenced by the number of pieces of clothing I’m wearing (i.e. the fewer the better). I’m looking forward to testing this theory. Although my mileage isn’t completely back on track after this week, it has been a marked improvement on last week’s write off. I’ve run four times, although three of those were only 5k or less. On Tuesday, I ran only a couple of hours after leaving my colleagues in the pub (I won’t be drinking pint or two of pale ale the wrong side of a run again). And Saturday’s parkrun was probably the most hungover I’ve been whilst running and definitely the closest I’ve ever been to vomming in public. Can you see a pattern here?! After a night of no wine (!) and a full 8 hours sleep, I got up on Sunday morning to tackle 18 miles. The first 11 were run on my own (the longest I’ve ever managed solo) along Regent’s canal before meeting Stephanie in Hyde Park. By the time she appeared before me, my knees had already decided I wasn’t going to make it all the way back home, but stopping after 14 miles by Embankment and diving straight into a giant latte felt like progress nonetheless. On Friday, I fly to Barcelona for a long weekend, and I’m already excited about clocking those 18 miles on Spanish soil. The Estrella at the end is going to taste so good. With eight weeks to go until race day, this week has been my ‘wobble’ week. The advantage of training for a marathon the second time around is that I am infinitely more relaxed about it than I was this time last year. This week I’ve probably been a bit too relaxed (read: not so much relaxed, more just ignored the fact I’m supposed to be marathon training altogether), but this time I’ve got the experience to know I’ve still got time to turn it around. This week has been dominated by work (reaching the peak of pressure as we approach year end) and an awful lot of drinking. Stress, alcohol, very little sleep and not much exercise is always a pretty rubbish combination. This has inevitably lead to feeling properly run down and having to cut short today’s planned 17 miler after only a couple of miles thanks to being (the bad kind of) sweaty and really quite snotty. Mmm. Tomorrow is a new day, next week is a new week and this is just a wobble.